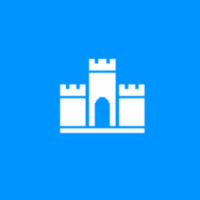 Over that last several months Chris Koenig and myself have been working on a Windows Phone 7 application that helps ease the task the picking the kingdom cards for playing the game of Dominion. Version 1.0 to the market place and received certification in 3 days and it went live over the weekend. It has been an awesome project to work on and we have a few features we want to add in version 2.0. 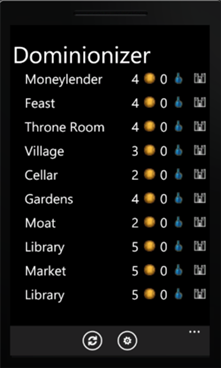 Currently supported cards sets: Dominion, Intrigue, Seaside, Alchemy, Prosperity, and Cornucopia, as well as the three promo cards. I want to thank Chris for all of his support and patience while working with me on the project. If you are a fan of Dominion please check out. Dominionizer is an application to help ease the task of picking the 10 kingdom cards needed to play the card game Dominion. 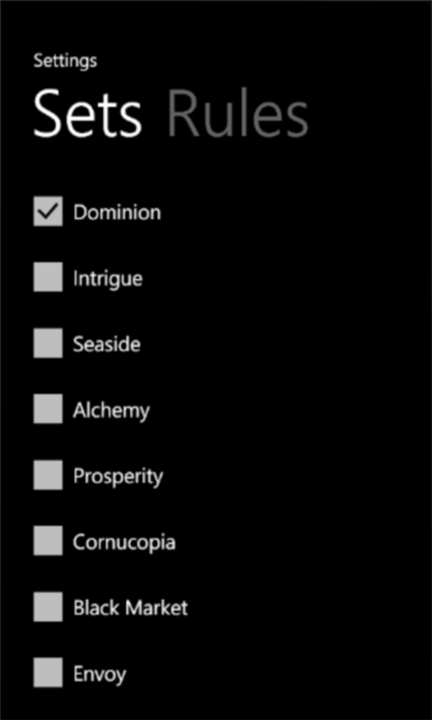 Diminionizer supports the following Dominion, Intrigue, Seaside, Alchemy, Prosperity, and Cornucopia, as well as the three promo cards. Settings allow you to control which sets are included in random selection. 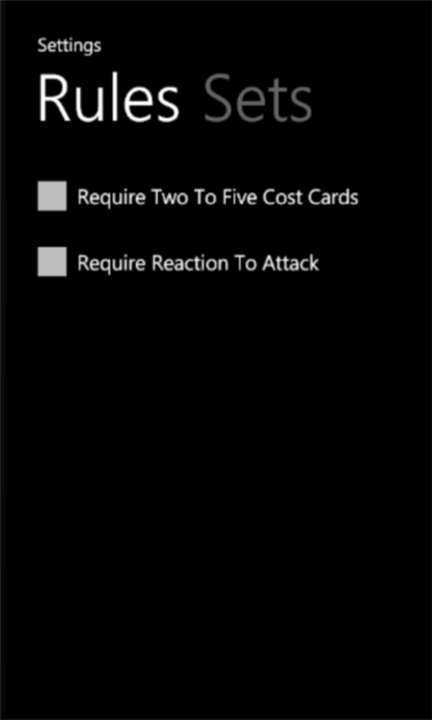 Other options allow you to apply rules to how the cards are picked, current rules allow for Require 2-5 Cost Cards and Require Reaction To Attack. Once the cards are picked you may swap a card out for a different randomly selected card by tap-hold and selecting Swap Card. 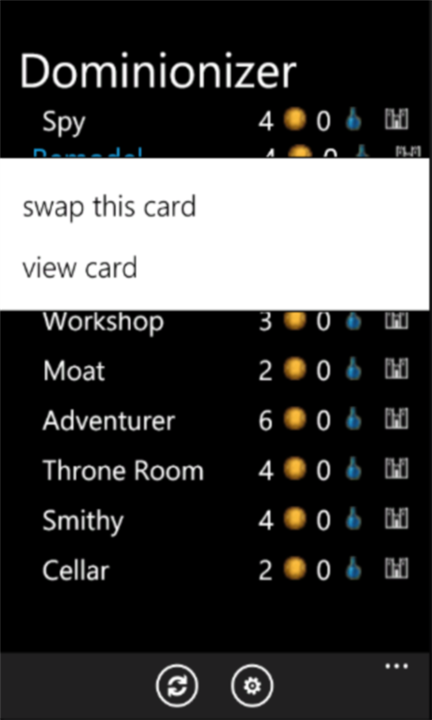 If you can't remember what a card does you can also tap-hold and select View Card to see the card information. The main screen displays the randomly picked cards along with cost, potion cost, and an icon to indicate which set the cards came from. 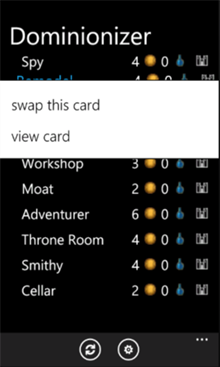 If you do not like a card you can use the hold menu to swap the card for a different card, or view an image of the actual card. 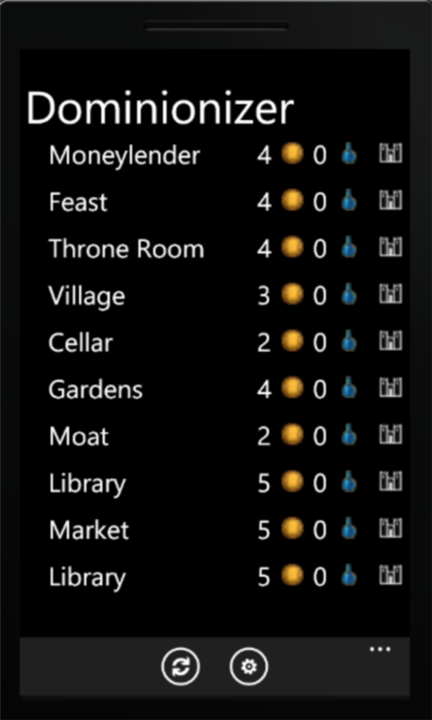 Settings allow you to control which sets are used for the card selection, and rules allow you to control how the cards are picked. If you want to make sure you have an even spread of cost you can turn on the Require Two to Five Cost Cards rule. 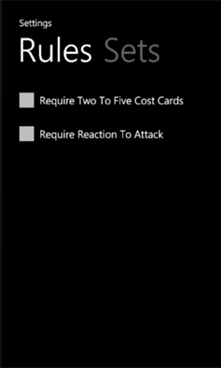 If you don’t want to have an attack card without a way to defend yourself turn on the Require Reaction To Attack rule. You have been hearing a lot about the new Window Phone 7 lately. Did you miss the bubble with iPhone development because you didn’t want to learn a whole new language and framework? Then you're invited to a hands-on event for Windows Phone 7. Get some help getting your Windows Phone 7 app into the marketplace. You’ll receive everything you need to develop an app—including some good community fun, sample code and templates. You can work individually or collaborate with others as a team. Chris Koenig, Senior Developer Evangelist with Microsoft will be joining me for this fun, fact filled, dare I say Lab filled event. Attendees will also receive a special entry card for a chance to win a Windows Phone 7, after your app has been submitted to the marketplace.